With winter comes slushy snow and salt stains on your shoes. 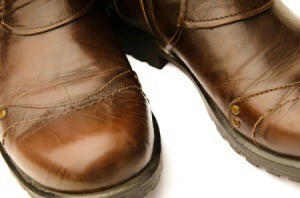 This is a guide about removing salt stains from shoes. I have shoes with wood platforms that have been salt stained. How do I safely remove the salt stains? Also, is there a way to treat them to prevent this from happening again? White vinegar will take care of the propblem. Use 50/50 with water. After the stain is removed use a wood polishing wax over the wood. It will repell the salt and water. My first thought regarding how to prevent it from happening again is to wear boots and take your shoes with you. How do i remove salt stains from shoes/boots?